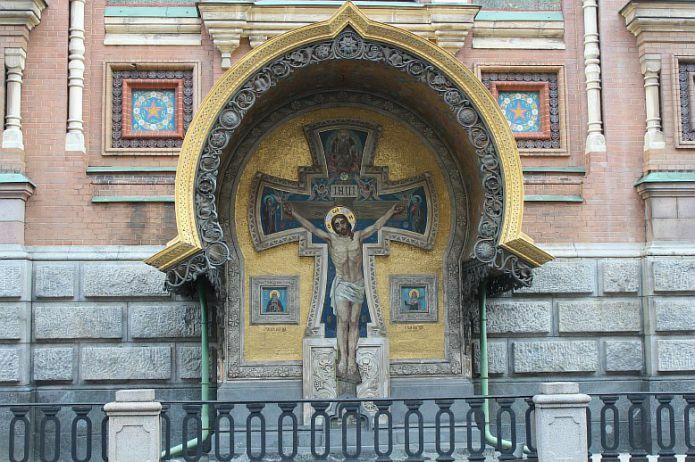 The Church of the Resurrection of Christ, or as it is also called the Savior-on-the-Blood, was erected on the spot where on March 1, 1881 Alexander the Second was fatally wounded by the People's Volunteer Ignatii Grinevitsky, also known as the “Tsar Liberator”. It was he who on February 16, 1861 abolished serfdom in Russia. In order to preserve the memory of the king-martyr, on the very spot where these events took place, it was decided to build a cathedral. Funds for the temple were collected throughout Russia. A competition was organized for the best design of the temple of the Tsar-Martyr, in which the architect Alfred Parland won, who later worked together with Archimandrite Ignatius (Malyshev). 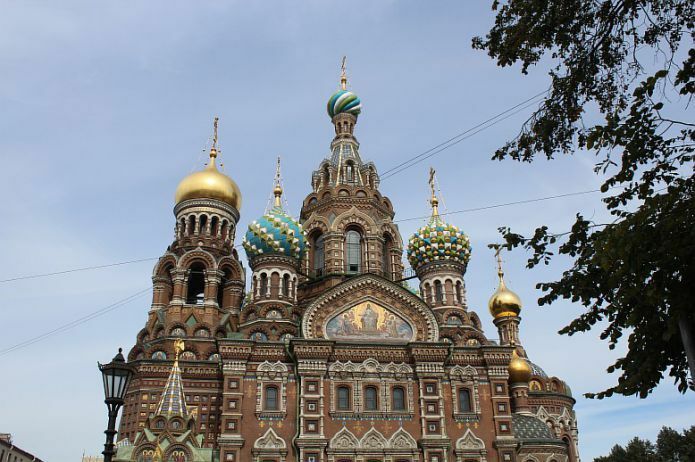 The church was built in the Russian style of the XVI-XVII centuries and is very similar to the Moscow Cathedral of St. Basil the Blessed. The color decoration and rather complex picturesque silhouette distinguish the Savior-on-Blood from most of the architectural structures of St. Petersburg, which are distinguished by the severity of color combinations and proportions. Remarkable is the Spas-on-Blood largest collection of mosaic panels and mosaics, which are made according to the drawings of Nesterov, Vasnetsov and other famous painters. Outside, mosaic compositions emphasize the main details of the cathedral, and in the temple itself they completely cover domes, walls, arches and pylons. 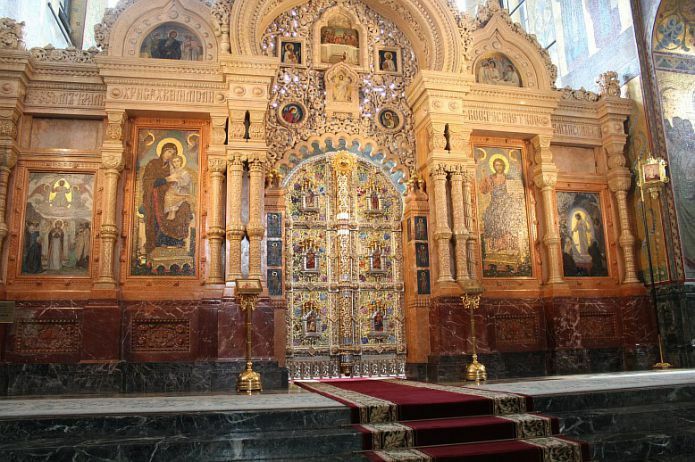 The interior of the Savior-on-the-Blood is a natural mosaic museum. The total area of ​​all mosaics is 7065 sq. M. The mosaic exposition of the cathedral is considered to be one of the largest collections in Europe. Icons for the iconostasis, made in the technique of mosaic, sketches Vasnetsov and Nesterov. - "Savior" and "The Virgin and Child". Italian marble and various types of semiprecious stones such as topaz, rock crystal, jasper, etc. were used in the design of the temple. 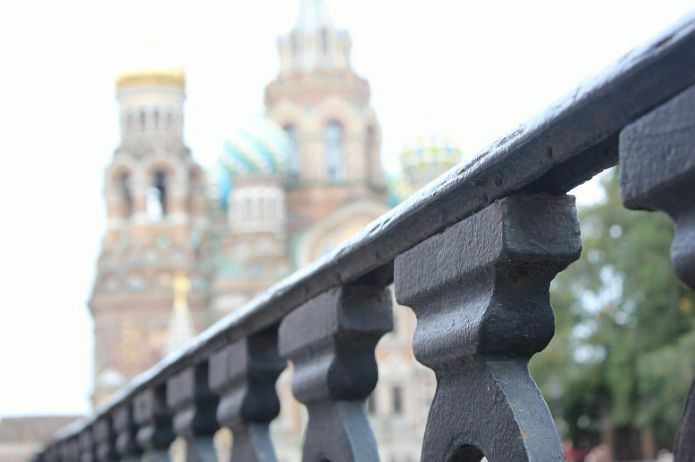 20 granite planks were fixed on the base of the cathedral, which told about the main events during the reign of Alexander II and his best reforms. The bell tower depicts all the provincial and regional emblems of Russia. The highest dome of the cathedral is 81 meters. The domes are covered with multicolored enamel and gilded sheets, and the altar cupola is covered with golden smalt. 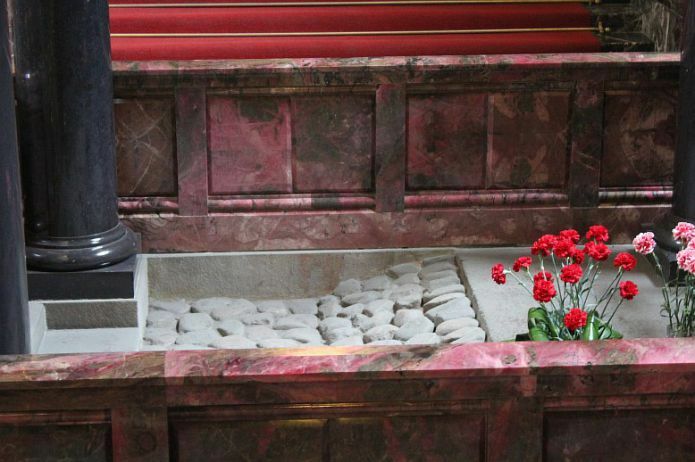 Inside the Savior-on-the-Blood is the site of the assassination of Alexander II. Reached to the present, fragments of the embankment are parts of the pavement, as well as cobblestones of the pavement, it was on them that bled to death, the emperor. 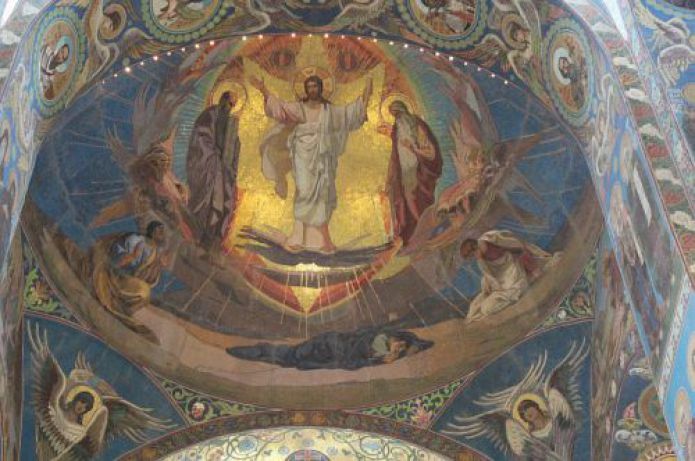 During the Soviet era, the Savior-on-the-Blood suffered greatly. From the 30s to the 70s of the 19th century, there was a warehouse in the temple, which caused appreciable damage to the decoration and the cathedral itself. Only in 1970 the cathedral began to be restored. The restoration lasted 27 years. Today in the Savior-on-Blood can visit anyone. From the Mikhailovsky Garden, the Church of the Resurrection of Christ is fenced off by a semicircular fence, made in 1903-1907 according to the design of A. Parland, at the K. Binkler factory. 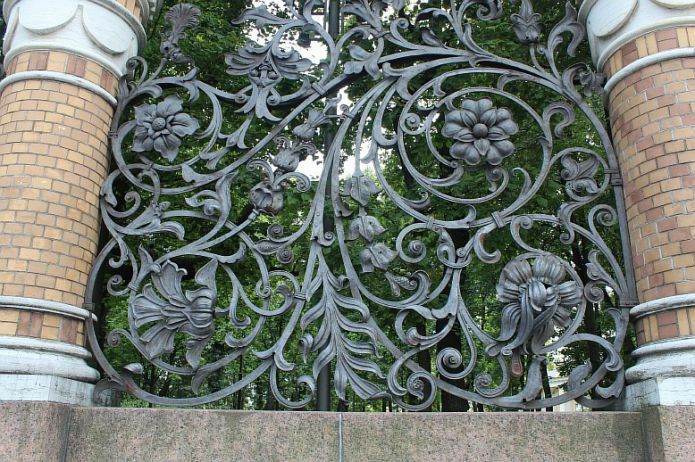 The drawing of forged links with a large floral ornament is similar to samples from the early modern style. 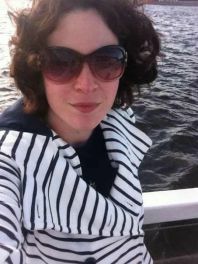 According to the legend, there is an icon in Spas-on-the-Blood, with encrypted dates, all significant events for Russia: 1917 - October Revolution; 1941 - World War II; 1953 - the death of Joseph Stalin; and dates of some other events. Visitors say that on this icon you can see another date, which relates to the future, but no one has yet succeeded in accurately distinguishing the numbers. Another legend about the temple appeared relatively recently. It is known that during the years of Soviet rule, the council was treated, to put it mildly, in an inappropriate way, making a warehouse in it, not worrying at all about how this would affect its interior decoration. In 1970, the church decided to restore and organize in it a museum of ceramics. The whole cathedral girdled with forests. The restoration lasted decades, it even seemed that it would never end. It was then that a rumor passed that the power of the Soviets would be in the country until the temple was entangled in the restoration forests. It may be considered a coincidence, but in 1991 the forests were dismantled. And in August 1991, there were famous events that led to the end of Soviet power.